2012, 96" x 101". Cotton. Machine pieced. Machine quilted by Castle Path Quilting. The summer of 2011 was a bad one in central Texas. A serious drought led to wildfires that sprang up all over the region. The worst occurred east of Austin around the town of Bastrop. Over 1000 homes were lost in that fire. This quilt started out with a challenge from the Austin Area Quilt Guild: make quilts for children who’d lost their homes. I started making cat blocks. But then I decided that I wanted to make sure that my quilt went to someone who would really appreciate the cats. So I went to talk to Scott Sutcliffe, one of the tech support folks in the CS department. Scott is also a volunteer firefighter in Bastrop. I knew that he and his wife Sara had lost their home in one of the first days of the fire and had then spent the next week and a half putting out the fire and trying to save other people’s homes. I thought Scott would know a family who should get my quilt. But as I talked to him it became clear that we had our family: Scott and Sara. Of course, then the project grew from a kid-size, twin bed quilt to a grownup size queen (and in the end almost a king). But that’s okay. The fabrics were a lot of fun to collect. Most of the blocks are made from cat fabrics, but some represent Scott and Sara and their interests. There are fires, fire engines, computers, scientists, chocolate, music, motorcycles, pine trees, bluebonnets, and emus. Click here for a bigger picture that shows them more clearly. 2008, Silk. Machine pieced, minimally machine quilted. 2010, 86" x 68". Cotton. Hand and machine pieced, machine quilted, hand embellished. My view of America: We're a nation of people from across the globe. We live in communities organized into states, with a shared vision but a set of individual personalities. We've built on the natural resources that we found here to create a cultural heritage, ranging from basketball to Hollywood, rock and roll to Norman Rockwell, Robert Frost to the Simpsons. We invented Girl Scout cookies and ice cream sundaes. Then we adapted pizza and sushi to our taste. And we’ve shared it all with the world. We’re scientists and engineers. We were first in light and first in flight. Then we created the Internet. We showed the world that large-scale democracy could work and we saw our process in action when we elected our first black president in 2008. This quilt celebrates our history and the role we can play in forming a future for our planet. Each block in the quilt tells a story through a combination of the fabric in the window and the embellishments that accompany it. Click on the picture of the quilt for a bigger image that lets you see more of the detail. You should be able to blow it up and scroll around. America was displayed at the 2010 Austin Area Quilt Guild show, where it won a Judge’s Choice award. 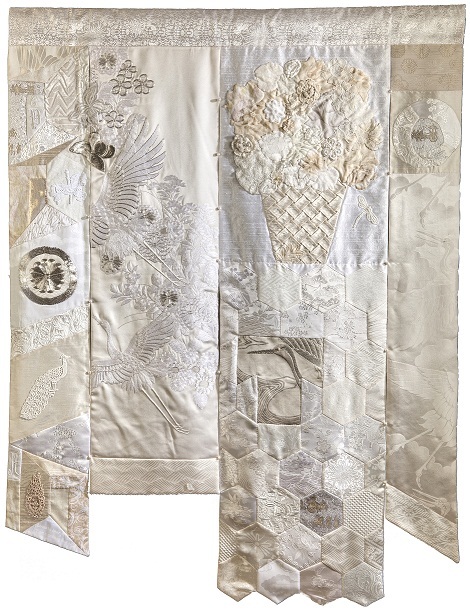 1995, 96" x 60" Predominately cotton, with silk, polyester, and velvet center pieces. Hand and machine pieced, machine quilted. This quilt was commissioned by a friend, Elaine Kant, to fill a large blank wall at the office of Scicomp, the company she had just started. Elaine chose the basic color scheme. 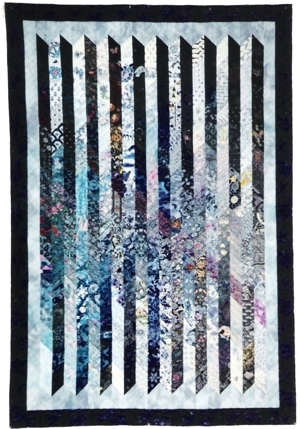 We both wanted a somewhat untraditional design and I'd seen a block similar to this in Miriam Nathan-Roberts' quilt, The Lady or the Tiger, shown in New Wave Quilt. When first I saw that quilt, I knew that someday I wanted to make something like it. This was the day. Although the overall design of the two quilts is very different, the blocks are very much alike. Some of the fabrics in the quilt were chosen for their pictures of things that interest the people who work for the company. The peacock fabric was chosen because there's a peacock in the woods behind their building, as well as one near Elaine's house. The name for this quilt was chosen by the people at Scicomp; they all submitted candidate names and then voted for their favorite. 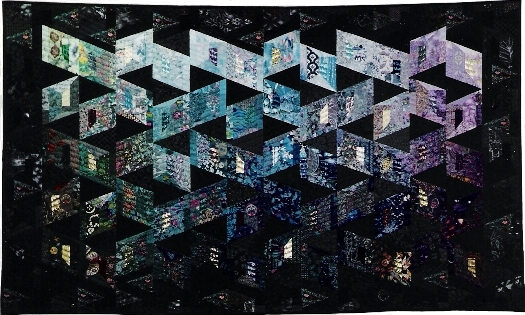 Jewels in the Night won an award for color in the Innovative Large category at the 1996 Austin Area Quilt Guild show. 2003, Cotton. Machine pieced and quilted. Slightly embellished. I made this quilt as a surprise for my friend Ann Daniel’s 50th birthday. Her husband Jim helped me spirit some favorite photos out of the house so that I could transfer them to fabric. The design is a Voronoi diagram. Each region has a focal point that’s a photo that is significant to Ann. The other fabrics in the region pick up the theme of the center piece. So, for example, there is a region for trips that Ann and Jim have enjoyed. Other regions represent favorite foods, Ann’s childhood, their home in Austin, and their family of cats. Click on the picture of the quilt for a bigger image that lets you see more of the detail. This design is relatively easy to make. Start with gridded interfacing the size of the final quilt. Draw the Voronoi diagram, then cut the interfacing on the region boundaries. To make one region: place the focal point somewhere in the region. Then use the sew and flip technique, as for a log cabin, to grow the region outward until it is completely covered (plus a seam allowance) with fabrics. Finally, sew the regions together, using the cut lines of the interfacing as the seam lines. 1993, 55" x 60" Cotton. Hand pieced and machine quilted. I love the tumbling blocks design, and I realized that, with a little cheating around the edges, I could work a yukata shpae in among the blocks. And without any cheating I could use some whole hexagons to show off a few larger designs, such as the Japanese kamons (family crests) that are appliquéed on several of the hexagons. About half the fabrics are Japanese yukata samples. The others are American fabrics whose designs look somewhat Japanese. Finding such fabrics was not very difficult because blues in general are easy to find and because Japanese designs have been very popular for the last several years. Although most of the fabrics are blue and white, some of the yukata samples have splashes of other colors. 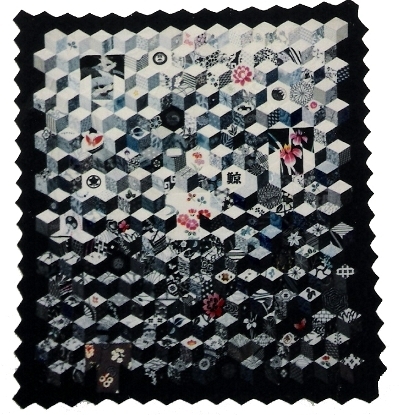 The quilting is primarily yukata shapes in various sizes, tumbling down the quilt. 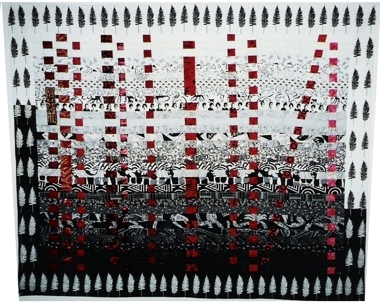 Tumbling Yukatas was exhibited at the 1994 Austin Area Quilt Guild show. 1993, 88" x 84" Cotton. Machine pieced, hand appliquéed, and machine quilted. I love teal and turquoise, and discovered that I had collected a lot of fabrics in these colors, just because I liked them. So I needed something to do. Fans are fun to work with because you can make each fan out of a few fabrics that work well together, then worry later about the global design. 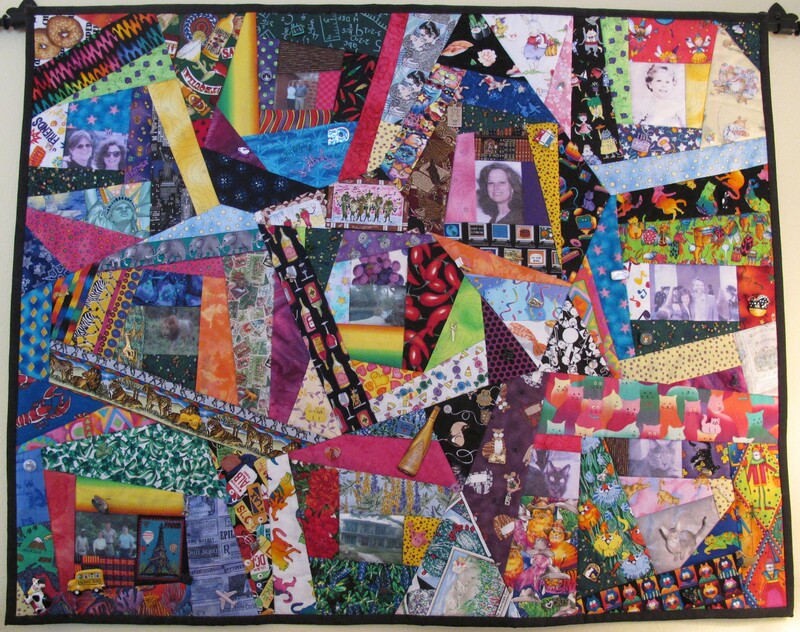 The crazy quilt layout made this particularly easy, since the fans didn't all have to be the same size or the same shape. In July, 1993, my father had prostate surgery in Washington, D.C. Alan and I went up to spend three weeks with him when he got out of the hospital. I took a whole suitcase full of turquoise and teal fabrics home to Maryland and sat at Dad's dining room table making fans. I was particularly thrilled with the center fan, which uses a turquoise lace appliqué that I bought in the dusty fabric department of an even dustier department store in New Orleans. Once I got home and had all the fans made, I spread out the navy background fabric on our living room floor and started arranging the fans. Of course, I discovered that I didn't have enough. So I collected some more fabric and made some more fans. 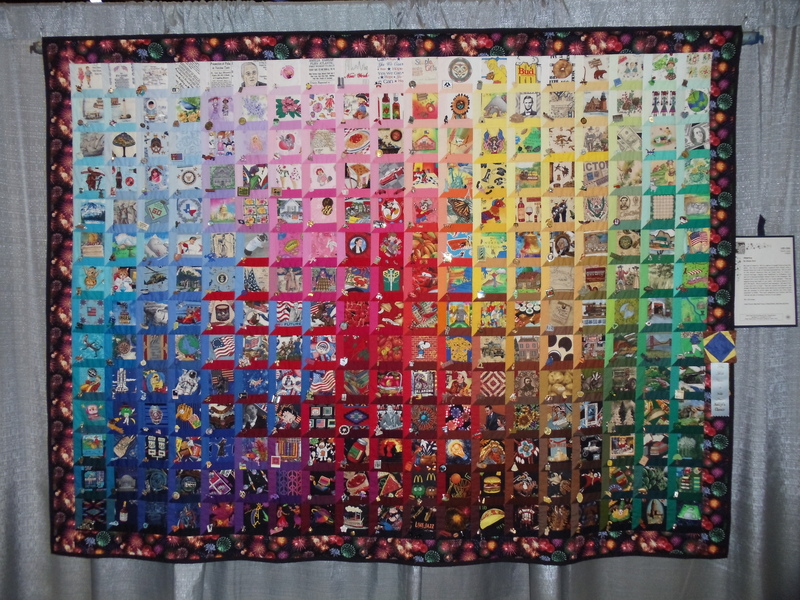 Fanfare won a Color Award of Excellence in the Innovative Large category at the 1994 Austin Area Quilt Guild show, and it was displayed at the 1995 IAQA show in Houston. 1997, 42" x 45" Cotton. Machine pieced and quilted, with some hand appliqué, and many embellishments. I started collecting Halloween fabrics some time around 1993. I couple of years later, I came up with the idea of making a web and filling each segment with a different fabric. In early 1997, I drew the design and realized that I could make the actual webbing with bias strips, the way I'd learned in the stained glass quilt class I'd taken at my first AAQG Gift of Quilting in 1993. Dorene Cohen decided she wanted to make one of these too, so one day, we finally sat down and cut out our fabrics. A couple of months later we got going again. We went to the fabric store and tried out various colors for the webbing. Purple won, hands down. Because of the trouble I'd had hanging Round and Round and Triangles, I decided I wanted to appliqué my web to a background rectangle. I tried various patterned fabrics but they all competed with the web, so black won. The most fun thing about working on this quilt was collecting all the "doodads" that are sewn on to it. 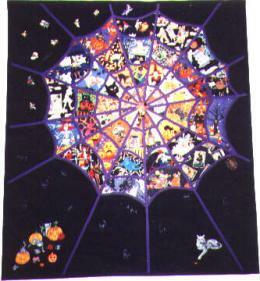 There is an amazing amount of Halloween stuff available, so the quilt is covered with spiders, witches, cats, webs, candy corns, and other random things. The Web was displayed during October, 1997 at Webb Middle School in Austin. 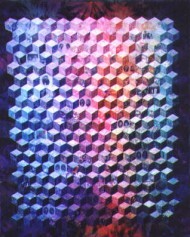 1998, 51" x 64" Cotton. Hand pieced, machine quilted. This was my first quilt that exploits photos transferred to fabric. There are photos of five generations in Alan's family, from his and his brother's children back to Alan's great grandparents. Alan did a lot of work with the pictures to format them so they'd look good on the quilt. We printed all the photos in black and white, and then transferred them to colored fabrics. Most of the fabrics are hand dyes and batiks. Alan made two labels for the back of the quilt. One shows who all the people in all the pictures are. The other is a family tree that explains how everyone is related. We gave the quilt to his parents for Christmas, 1998. 1996, 53" x 80" Cotton. Machine pieced and quilted. Making this quilt really put my collection of blue fabrics to the test. It was a bit different from many of the colorwashes I've done since there were two different parallelogram shapes. It was hard to know which column a particular fabric was going to end up in, so many of them had to be recut. I tried to use a lot of conversational prints, which turned out not to be too hard. The hardest thing was dealing with the fact that there are a lot differences among "blues". You can put a grey one next to a royal one, even if the values are the same. Fortunately, there were lots of columns, so I tried to group the various blue colors into columns. By October, 1995, I'd finished the tweed part of the top. But I didn't know what to do for borders. So I took the top to the Houston quilt show and, sure enough, found the light blue hand dyed fabric and the dark blue commercial batik. They were just what I needed. 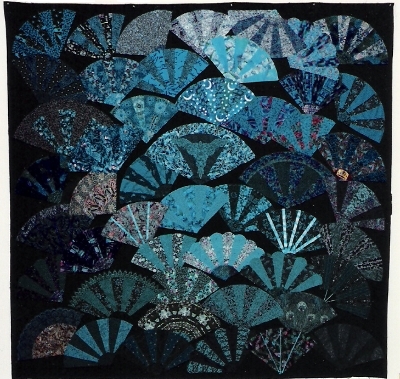 Blue Tweed was exhibited in the 1996 Austin Area Quilt Guild show. 1995, 47" x 38" Cotton. Tubes sewn by machine and hand stitched together. I love to collect black and white fabrics, as does my friend, Mary Shepherd. So this was fun to do. My favorite fabric in this quilt is one Mary bought several years ago. It looks like rows of yearbook pictures. I was planning to have all the vertical strips run perpendicular to the horizontal ones (like the warp on a woven fabric). But, as I had it laid out, Alan came by and said it was boring. He said I needed more whimsy. So one is crooked. 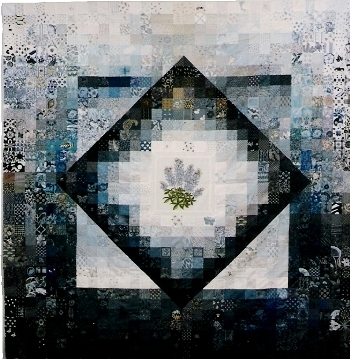 One is Crooked was exhibited in the 1996 Austin Area Quilt Guild show. 1994, 50" x 66" Cotton. Machine pieced and quilted. This quilt started out as an attempt to experiment with various designs that could be made with half-square triangles (and an occasional square with an interesting accent fabric). It was supposed to be just white, grey, and black, but that was too boring. First I added the fabrics with small bits of color. But there was still no spark, so I added the red stripe. When I added the plain border, the whole thing still seemed static. So I let a couple of the designs flow into the border, which created a bit more sense of motion. 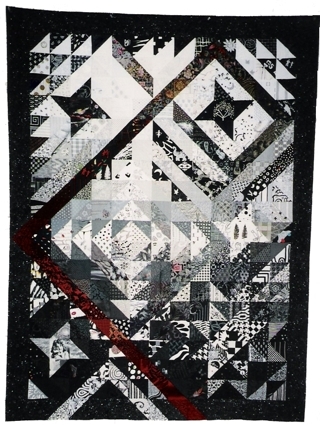 Shades of Grey was exhibited in the 1994 Austin Area Quilt Guild show. 1994, 90" x 85" Cotton. Machine pieced and quilted. This quilt was supposed to be pastel, with small areas of medium value for contrast. But I needed over 1500 different rectangles, so I started cutting from all the fabrics I could find. I discovered that my friends and I gravitate toward deeper colors. We also have a lot more reds and blues than we do yellows and oranges. Once I got bored with cutting rectangles, I sketched a very rough layout for the various colors. 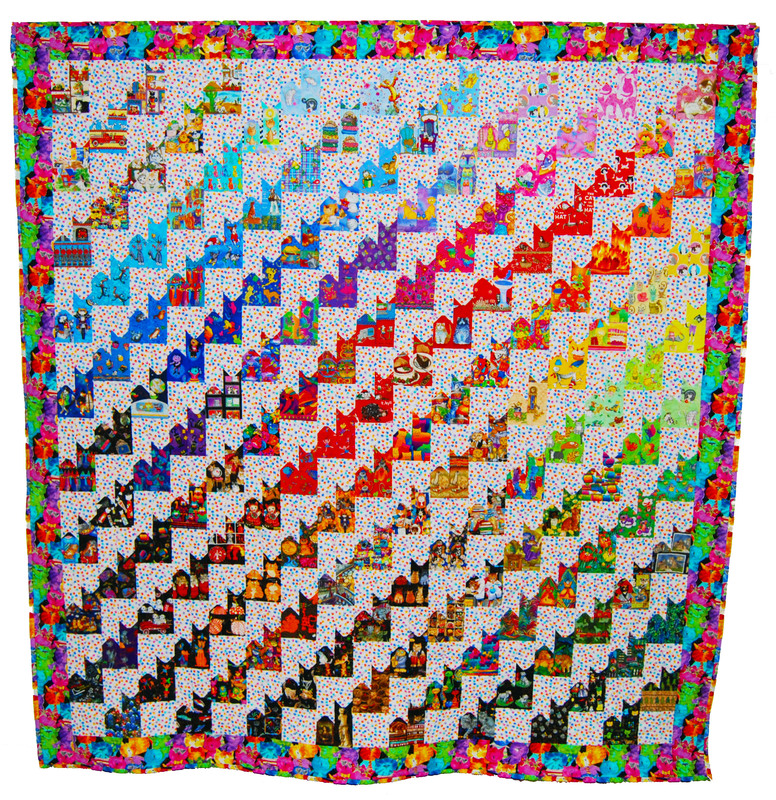 The uneven bargello design is meant to suggest the sort of semi-controlled motion of a waterfall. Almost all the fabrics contain a single salient hue, so each region reads strongly as a single color, just the way the bands do in a rainbow. Once I had a very rough sketch, I started putting pieces on my design wall. The final design really came more from the fabrics than from anything else, as some regions grew and others shrank. 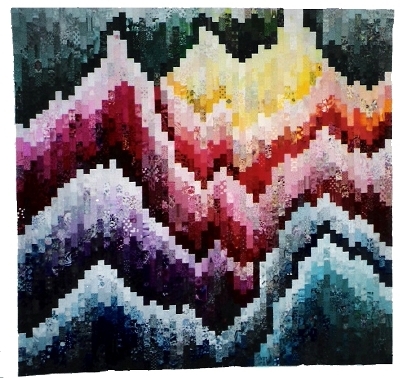 Alan calls this quilt "Dripping Colors". 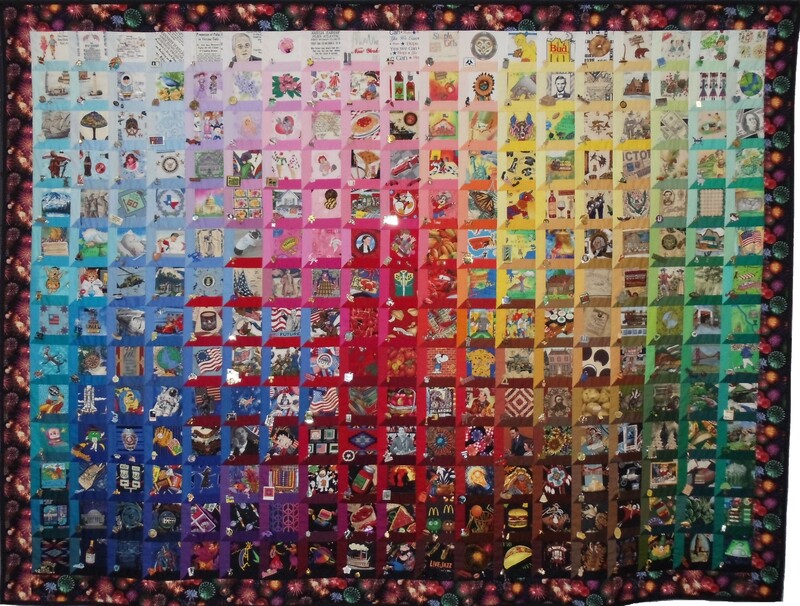 Rainbow Falls was exhibited in the 1994 Austin Area Quilt Guild show. 1994, 45" x 56" Cotton. Machine pieced and embroidered. Machine quilted. Embellished. I wanted to do a pastel colorwash. But such a thing, all by itself, would wash out and be boring. I need some sort of contrast. I'd read Ruth McDowell's book, Pattern on Pattern, and thought that her idea of one design literally superimposed on another was a really great idea. So I decided to see-through burgundy leaves to my pastel colorwash. When the leaves fell on top of yellow, they'd be orange. On pink, they'd be deep burgundy. On blue, they'd be purple. Of course, there are more at the bottom, gravity being what it is. When it came time for the border, I went to the quilt store thinking that what I really needed was leaf prints that weren't green. I wouldn't have bet much that I'd find them. In fact, I got to choose, there were so many. So the border itself is a colorwash. Mary Shepherd and I used Autumn Leaves as a sample in our 1995 AAQG Gift of Quilting Class, Pastel Pizzazz. 1995, 47" x 62" Cotton. Machine pieced, hand appliquéed, and machine quilted. I wanted to take another shot at a pastel colorwash. This time I thought that, instead of piecing in the contrasting design, I'd appliqué it on. I love butterflies, and there are some great butterfly fabrics available. The bottom of the quilt is meant to represent ground. It has flowers all over it. The top, obviously, is the sky. It's filled with butterflies. Alan suggested making a gradual transition from flowers to butterflies. Nature doesn't do it that way, but it's interesting in a quilt. 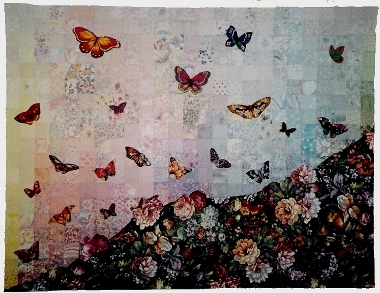 So the butterflies at the bottom of the quilt are part flower, part butterfly. As you move up, you get to the 100% butterflies. To make this quilt, I needed a foundation. Rather than adding batting to the quilt, I just left the foundation there and quilted through the top, the foundation, and the back. I found the perfect back for this quilt. It's a butterfly design, done completely in pastels. 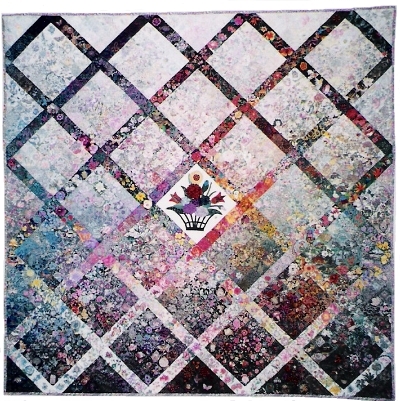 Mary Shepherd and I used Metamorphosis as a sample in our 1995 AAQG Gift of Quilting Class, Pastel Pizzazz. Cotton, Machine pieced, hand appliquéed, and machine quilted. This quilt was inspired by a picture on the back of a menu at a 50's revival diner. I looked at the sort of air-brushed picture of an ice cream soda and suddenly realized I could do ice cream in fabric. Collecting the ice cream fabrics turned out to be easy. Some hand dyed and marbled ones worked particularly well. The cones were a bit more of a problem, so there are some duplicated fabrics in them. The jelly beans in the border tie the colors together and the candies in the border insets reinforce the "sweets" theme. 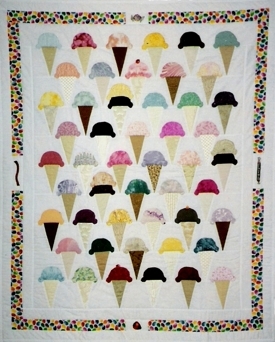 The back of this quilt is perfect -- it's huge ice cream cones with dripping pink ice cream. Mary Shepherd found it for me. 1992, 84" x 84" Cotton. Machine pieced and quilted. This is a graduated quilt that I made as a wedding present for my friends Susan Brienza and Jeffrey Rubin-Dorsky. Their initials, S and J, are in the medium blue region in the bottom half of the quilt. The bluebonnets in the center represent the fact that the quilt was made in Texas, where every spring massive pilgrimages to visit bluebonnet fields take place. 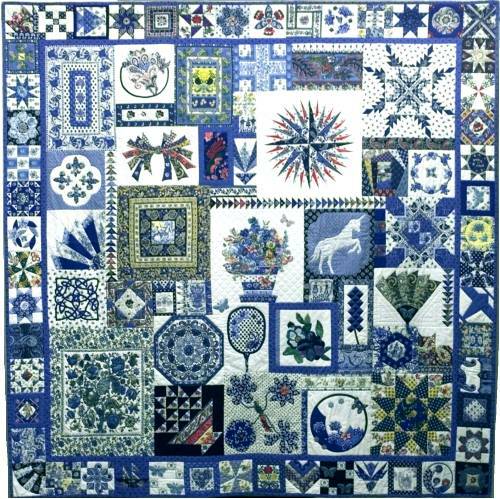 Although there is no topical theme, there are regions of the quilt that contain related fabrics. Notice in particular the Japanese yukata fabrics along the right edge of the quilt. 2000, 84" x 84" Cotton. Machine pieced and hand appliquéed, machine quilted. I fell in love with Provençal fabrics on a trip to Avignon in 1992 and lugged home kilos of them. Then, that fall, I took a class at the 1992 Houston quilt show. The class, called "A Sweet Smell of Provence", was taught by Soizik Labbens. In the class, we made a blue medallion, starting with a scarf. I didn't end up using that in this quilt because it is a bit too grey/brown, but the idea for this kind of quilt has been swimming in my head ever since the class. Meanwhile, ever since my Christmas quilt Joy in 1995, I'd been fascinated by the idea of combining a large number of unrelated, unequal size blocks. I thought, "Why not try again on a grander scale?" This quilt grew one block at a time. Some of these blocks (like the unicorn and the center flower pot) were driven by the design of a block I liked. Others started with a group of fabrics that looked great together and went in search of a block. My favorite is the unicorn. Some of of the appliqué blocks took months to do, as I worked them while watching TV or sitting on a plane. Many thanks to Dorene Cohen who brought back some great fabrics from a trip to Provence in 1998 and kindly contributed them to my stash. 1997, 84" x 84" Cotton. Machine pieced and quilted. I made this quilt as a wedding present for my friends, David Jefferson and Kathy Gilcrest, who were married in September, 1996 after the longest courtship on record. The quilt is a scaled up version of Friendship Garden. Again, Patricia Luther made the center block. Most of the squares in the quilt are simply flowers. But I tried to include as many cats and gardening things as I could for Kathy. For David, there are two dinosaurs, one patriotic piece (symbolizing Jefferson) and one computer chip. The label on this quilt is my first attempt to transfer printing and a photograph to fabric. I finished this quilt and gave it to David and Kathy almost exactly a year after their wedding. 1991, 42" x 42" Silk and cotton. Hand appliquéed, machine pieced, hand quilted. I made this quilt for my father, who, at the age of 70, took up dancing, and has become almost as fanatic about it as I have about quilting. 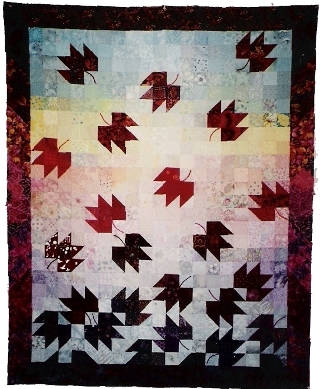 The nonappliquéed blocks form a graduated "subquilt" that serves as a background for the appliquéed dancers. The subquilt is graduated, and flows from light to dark and from pink to purple. It simply wasn't possible, at the time I was making this quilt, to find enough pink and purple on white background fabrics, so several of the pieces at the top of the quilt were hand painted, often starting with a black and white print and then filling them in with pink and purple. 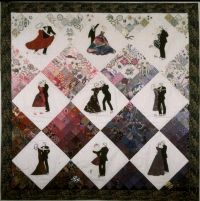 Dancers was displayed at the 1992 Austin Area Quilt Guild show and at the 1992 IAQA show in Houston.